One key to a successful website is accessibility. This means providing the means for all users to pick and choose the content they want to pull up easily and intuitively. Most websites accessed from desktop computers are built with ease of use in mind, but visitors using mobile devices to reach your site might not see the whole picture. Your pages may be cropped in odd places and some elements may be distorted or not visible at all. Users might have to scroll down or pan vertically to finish a sentence. Are your visitors getting what they want where they want it? Presenting websites on different devices has been dealt with in the past by developing completely different sites or apps for each device, but this approach is cumbersome. A more effective approach is Responsive Web Design which allows your site to adjust automatically to the user’s device, changing the orientation, image sizes and layout, retaining a clean, intelligent, and easy to use interface. Responsive web design also accomodates mouse functionality with touch navigation and selection. The mobile device experience requires that you display fewer graphics than a desktop view, and it’s important that the download speed is super-fast, or your visitors will jump ship, causing you to lose sales to your competition. Now that the internet is in the palm of your customer’s hands, you want to ensure that your message is still coming across. It will with Responsive Web Design. 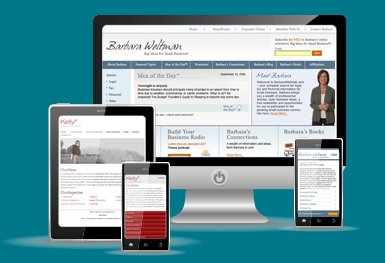 Learn more about what Responsive Web Design can do for you.